Covert Operation: A Yamaha XT 600 goes under cover / Surfingbird - проводи время с пользой для себя! Creativity is a tug-of-war between what the client wants, and the designer’s need for freedom. 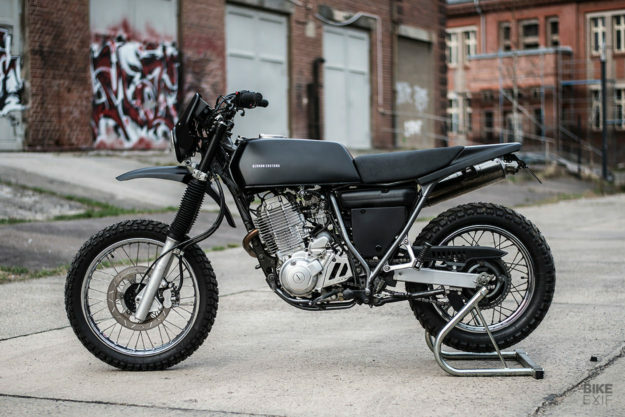 Building custom motorcycles is no different. In fact, some builders won’t even take on a job if they don’t have complete creative control. 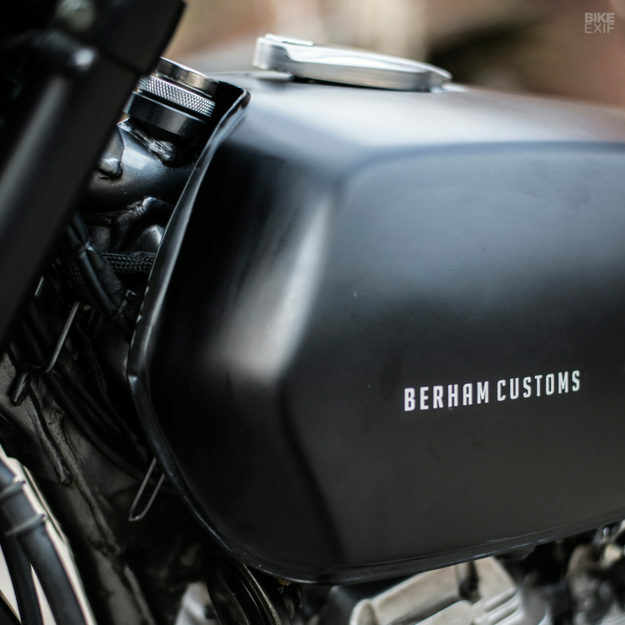 Martien Delfgaauw of Berham Customs in Berlin is a little more easygoing than that. 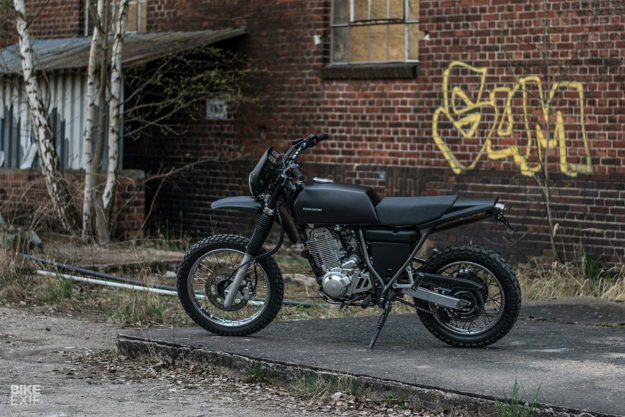 But even he was put off by the brief for this Yamaha XT 600. 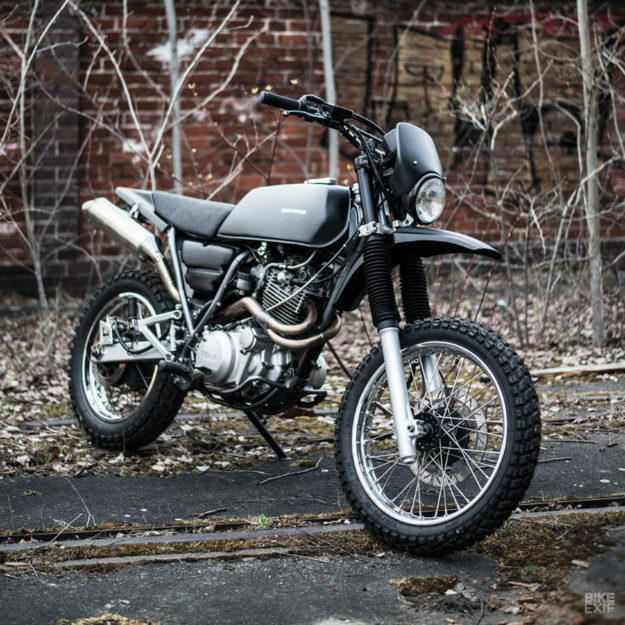 Rather than bend necks and drop jaws, this stealthy scrambler had to do the exact opposite—blend in. Not surprisingly, Martien was less than enthusiastisch. Berham create purpose-driven machines all the time. But even then, they go to town on the details—ditching air boxes and installing Motogadgetry everywhere. And none of that was going to be possible here. “It was too much of what you don’t want to get in a brief,” says Martien. He also had his hands full launching a line of parts for classic BMWs, in collaboration with KRT Framework. So he turned the project down. But the request kept preying on Martien’s mind. 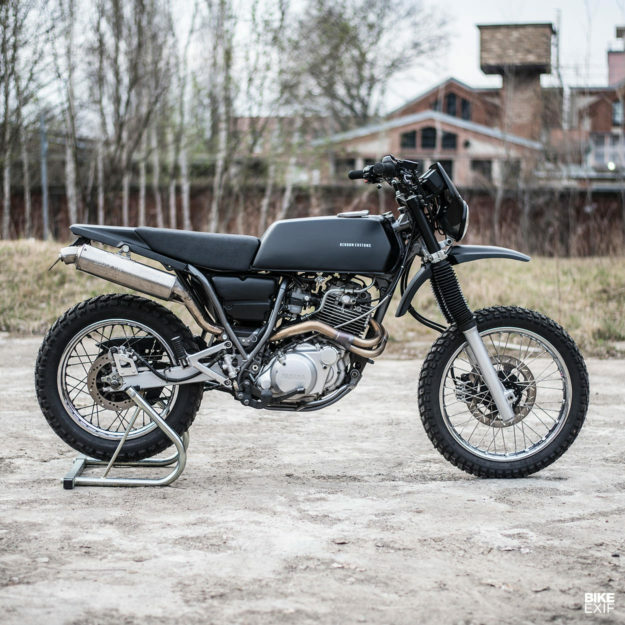 “It was a challenge,” he says, “and challenges are always tempting.” So a few days later, he called his client up and offered to rebuild the XT 600—provided he had plenty of time in which to do it. Once the Berham crew had ditched the XT’s stock bodywork, the first step was to source a large enough fuel tank that could create a neat line. 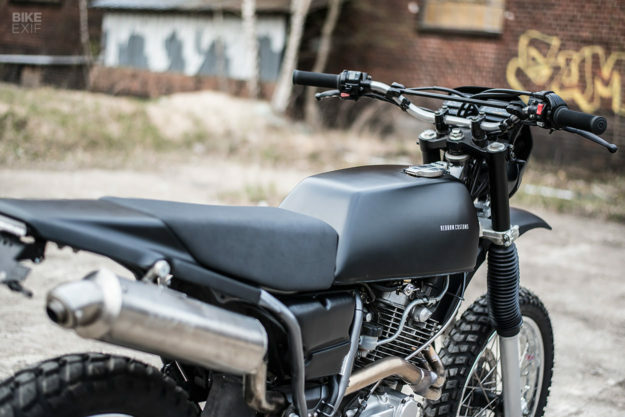 A Yamaha XS 500 unit fit the bill, but needed some serious massaging to fit the XT 600’s oil-carrying frame. Martien had to cut the tunnel out completely and rebuild it from scratch—without losing too much capacity. “This meant hours of shaping and beating sheet metal,” he says. He also welded in new threads for fuel taps, and threaded bushings for the new tank mounts. Next up, the frame was cleaned up and the rear end lopped off. A new subframe was fabricated and welded in, following a more angular line than the typical rear loop design. “The frame’s angles and the need to integrate the rear light called for a bit more trickery,” explains Martien. The tail section looks like a stock part off an enduro bike, but it’s actually been hand made from fiberglass. Martien had to weld in mounts for the seat, tail, exhaust and a new electrics box. Alex at Weitgehend Gar in Hamburg handled the upholstery, wrapping the seat pad in a waterproof leather. It had to be waterproof, because Berham’s client will be parking the bike outside, year-round. 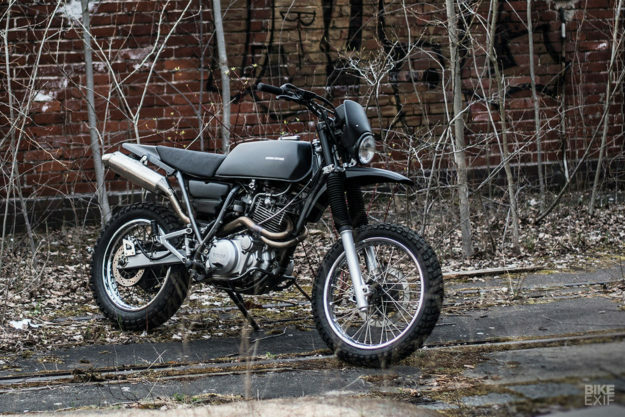 This XT 600 is most definitely not a show pony. That’s also why Berham had to keep the XT’s original airbox, rather than cleaning the space out and fitting open filters. Luckily they installed a modified Arrow TT exhaust, saving a little weight and helping the thumper breathe a little better. The rest of the bodywork is a mixed bag. The stock front fender stayed, but was reshaped to be smaller and sharper. 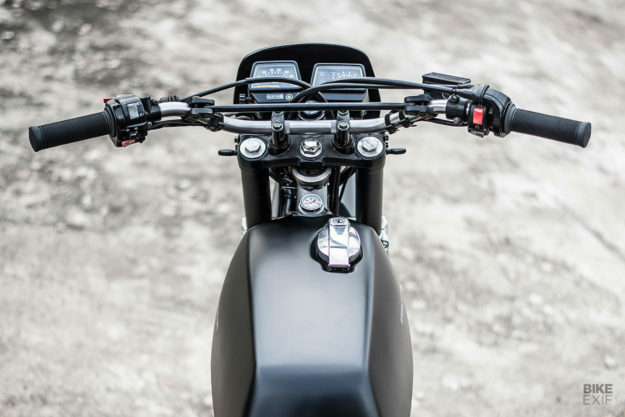 Lucas handlebars were fitted with new Biltwell Inc. grips, but the speedo and most of the controls are still OEM. 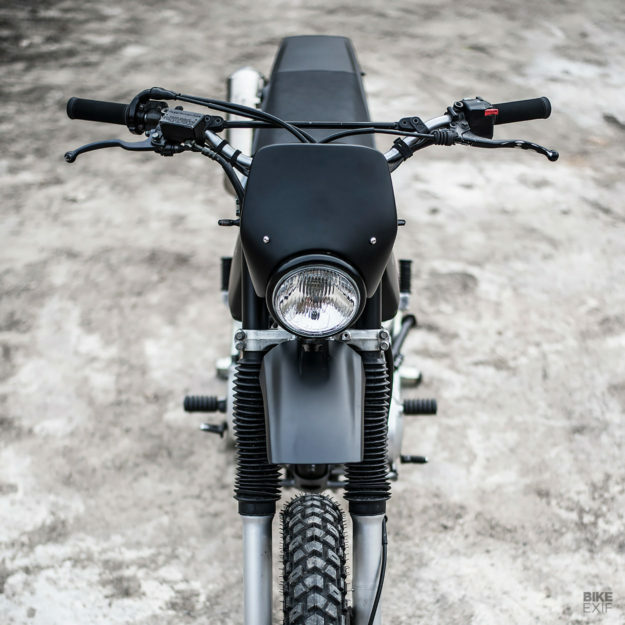 The headlight and shroud combo is a setup that Berham has used in the past: A standard Bates-style headlight, capped with a nacelle from Spanish moped manufacturer SRS. Just behind it are new upper fork covers, whipped up on the lathe. 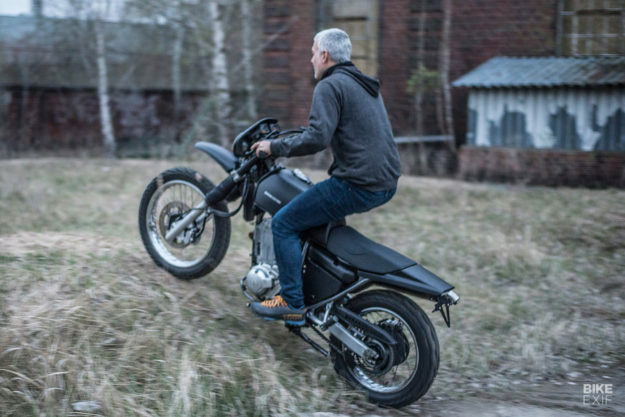 Lowering the bike was part of the brief, but Martien was hesitant to lose suspension travel. So he trimmed the stock suspension as little as possible, and swapped the Yamaha’s stock 21” front wheel for a 19” CWC rim, laced to the stock hub. That did the trick, with a set of Heidenau K60 tires adding just the right amount of all-terrain ability. With no room to breathe on the livery, the frame was refinished in its original color, and the bodywork in matte black. As for those electrical issues, Berham staffer Dennis wove a new wiring harness. 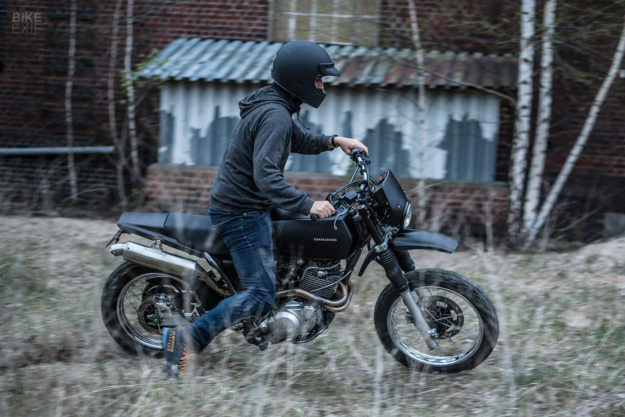 With the notorious TÜV stamp of approval, the XT 600 was finally ready to return to active duty—as a stealthy, rugged daily runner. The perfect custom for a rider who likes to fly under the radar.